Please replace the ‘at’ with an @, this is measure to reduce spam. We apologise for the inconvenience. Professor Matthew Johnson and his post-doctoral research assistant Sara Perry at Southampton University are currently engaged in a project on the work of Alan Sorrell and the visualisation of archaeology. They are keen to hear from anybody who worked with Alan Sorrell or had memories of him. This project is a short pilot study for further study. Some of you might have might have seen the news this August of the discovery of Britain oldest home, and the earliest evidence of carpentry in Europe. The Alan Sorrell above was seen by many in the newspapers as well as on national TY. 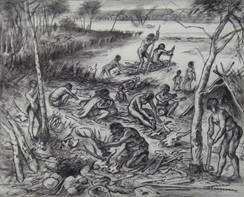 a 'reconstruction drawing' of the Mesolithic hunting camp at Star Carr. archaeological evidence for human dwellings, he was obliged to exclude them. vision has been vindicated with this exciting discovery! 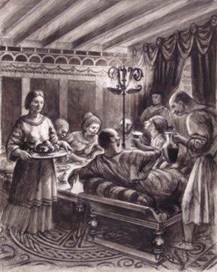 Click on the image right to link to our new video about the work of Alan Sorrell which features this this illustration from Roman Britain by Aileen Fox and Alan Sorrell, 1961. Every now and then interesting aspects about Alan Sorrell’s RAF career are brought to our attention. 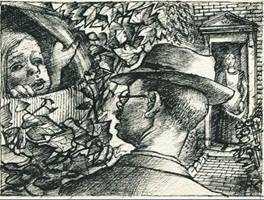 The art historian Roy Behrens from Northern Iowa University has recently placed the following about Alan Sorrell on his blogspot, which also gives an interesting account of the influence of camouflage on art in the 20th Century. Alan Sorrell’s recently restored 1951 Festival of Britain Mural was exhibited. 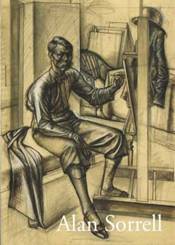 This book will come as a revelation to many lovers of Modern British art, revealing the range and quality of this important genre. In the first part, Alan Powers examines the motives behind the mural revival of these years and describes a wide number of works. The second part presents 15 case studies in which leading experts then shine the spotlight on some of the most important and enduring murals which have been out of the public eye for decades. These include previously unpublished Festival of Britain designs along with lesser-known masterpieces from the first generation of Rome Scholars. Many are reproduced in colour for the first time. 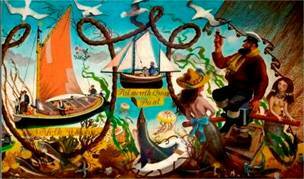 Originally produced for the Nelson Bar on the SS Campania, this mural has remained largely unseen since the Festival Of Britain. It will be hung along side John Piper’s Festival of Britain mural. 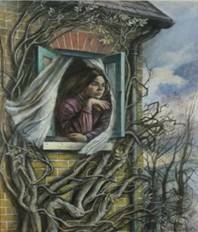 An opportunity to see a unique artist’s work at a unique museum. 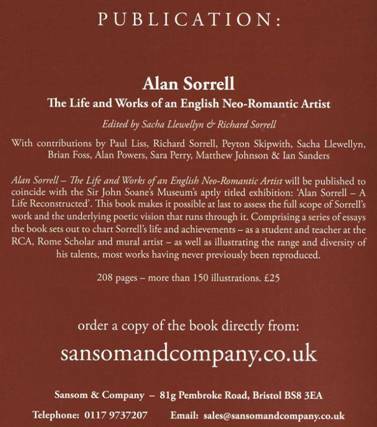 The first book publication about Alan Sorrell’s work for over 30 years, it has been produced to accompany the exhibition. Produced with the cooperation of the Alan Sorrell Archive including research and photography. 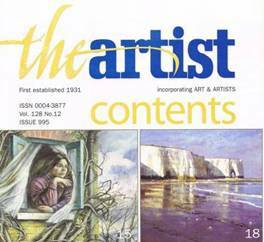 Curated by Julia Sorrell & Philip Athill. The exhibition to include many of Alan Sorrell’s archaeological reconstruction drawings for books such as Roman Britain and Imperial Rome, most of which will be on exhibition for the first time. 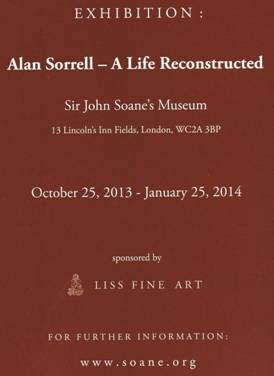 The exhibition includes works seen at the John Soane Exhibition 2013-14 (see below), works from the extensive Alan Sorrell collection at the Beecroft Art Gallery, and many works exhibited for the first time. The Edmund Gallery, Bury St Edmunds, Suffolk.